Working with lower back pain is never at the top of the fun list. At its best that dull achy feeling is a nuisance and major distraction. At its worst it can land you in bed for days or even weeks. It impacts your work efficiency, your productivity and your mood. But understanding what causes lower back pain and how to relieve it will get you back on your feet and working at your best. There are three primary causes for lower back pain. They include; organ related pain, pressure on the facets (joints of the spine) and a suppressed nerve. Organs can radiate pain to the lower back, which in turn may distract you from the real cause. For men your prostate health can trigger back pain. For women lower back pain can be redirected from the uterus or ovaries. In any case these require attention beyond relieving lower back pain so should be ruled out at the start. Structural causes include excess pressure on facets is characterized as a dull achy pain and is a result of an over extended bend at the arch. A disc bulge often results after years of walking around with a crooked spine unknowingly. The strain on the disc leads to fatigue where it eventually wears out and gives, bulging into the nerve. Both of these structural causes can be relieved with proper stretching and some adjustments to your habits. Regardless of what is causing your lower back pain chances are it’s having a negative impact on your work performance and could lead to missed work. But if you rely on your income to survive time off work is not an option. The good news is once you’ve ruled out any organ related back pain there are several things you can safely do on the job to minimize pain and help reduce the risks for further injury without taking time off work. If you send emails, or make calls to others in the workplace, try walking over to them to give them the message. This will get you up out of the sitting position, which can be detrimental to your back. It might not be practical each time, due to time involved, or the size of your office and environment. However, even if you can do it 3-4 times each day, it will help. While walking, it will loosen up the muscles in the back that were tightening up while sitting. 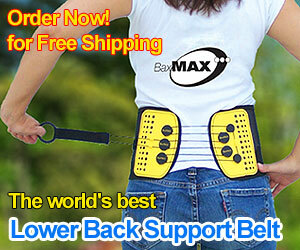 It will also allow you straighten the spine out a little bit for a short period. You might have certain tasks that are making your back pain worse, such as lifting. If you can’t avoid lifting, make sure you at least take the proper steps in lifting, no matter how light the object might be. Always lift with the legs, rather than the back. If there is substantial weight to what you are lifting, talk to your supervisor about tools that can help, such as straps, or a back support belt and ask for help lifting when needed. If you are experiencing temporary back pain your employer can offer restricted activities while it heals. Make sure that your environment is friendly to your back by not having things you need often throughout the day lying on the floor. If you sit at a desk all day, working with paper, it would probably be better to have the paper above you, where you would have to get up a few times, than having to bend over to get it from a bottom drawer. Perhaps your employer would be willing to have a meeting and invite a Chiropractor, or a Massage Therapist to come in during a meeting to discuss things you can do on the job to alleviate some of the back pain, or what you can do as treatments on your breaks or days off to come back to work feeling better. Dr. Jeff Echols, a doctor of Chiropractic Medicine, said that 80-90% of us will experience debilitating back pain at some point in our lives. Think about it. That is most everyone you know, or work with. There are non-invasive treatments available to help prevent surgery, such as massage therapy, or chiropractic treatments, with about 80-90 responding well to treatment. Some of these professionals can also give some nutritional counseling, which can also help to keep employees healthy…and on the job. I know it’s tempting to chat with the co-workers during the breaks, or sit at your desk to pay your bills while you have a chance, but it’s not the healthiest choice you can make. Going for a walk during your breaks, or stretching will do wonders for a back that is tightening up. If you want to catch up with what is going on with your friends at work, grab them to walk or stretch with you. They might appreciate the encouragement to take care of their back as well. Spend time doing some research for “work friendly” exercises that help to alleviate back pain while on the job and make them park of your break routine. Finally, between the morning, lunch, and afternoon break, stand up for a minute to stretch…about every 30 minutes or so. Some of these ideas are easily integrated into most routines on the job, while others might need a bit more convincing when it comes to your employer. If you need to convince management then do some research on how it can benefit the entire workplace rather than just you.